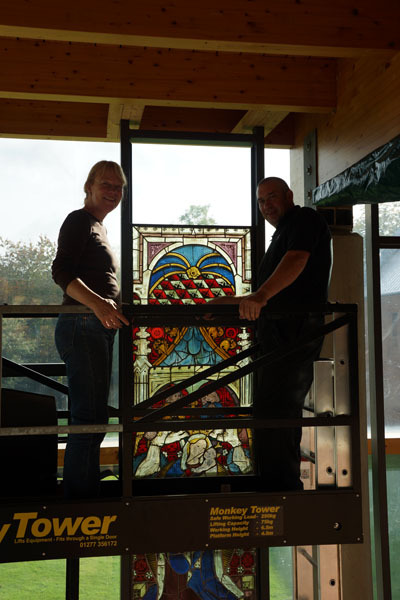 The project has been completed and it has achieved its main aims: we have documented and recorded the condition of the monumental stained glass windows from the Carmelite Church at Boppard, photographed them, conserved them and they have been returned to display in much improved condition. 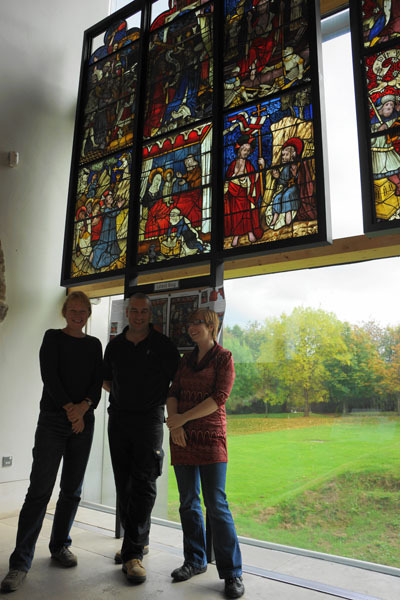 With careful resource planning and prioritising treatment we have been able to achieve more than was originally anticipated and all three windows are back on display. Two of them have a new frame system which will keep them safe and in good condition for the years to come. 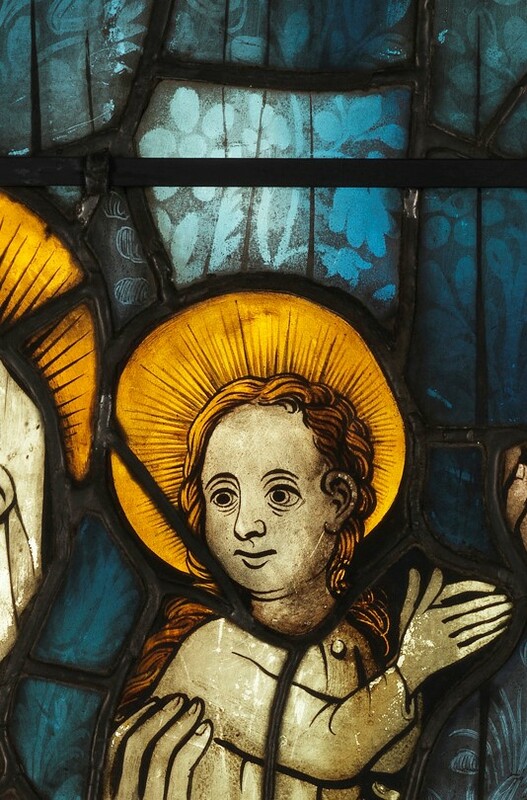 I was able to see almost all of the stained glass from the Carmelite Church that is distributed among Museums and historic buildings in the US and in Germany and to compare the condition of this glass with the glass held at the Burrell. This research has helped inform our conservation decisions and significantly contributed to the understanding of the restorations undertaken in the 19th and early 20th century. The project has enabled us to connect with conservators, archivists and historians in these other institutions and helped to further our knowledge and understanding of this important part of European heritage. The scientific analysis undertaken by Cardiff University was very useful as we were able to prove the presence of a copper based resinate paint. 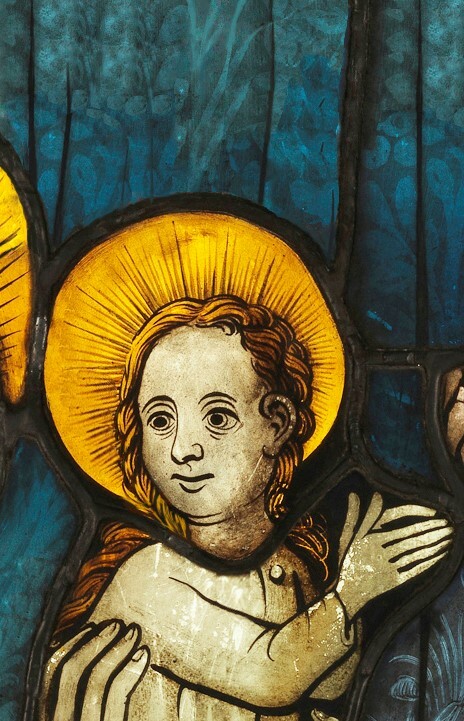 This use of unfired paint was perhaps not so unusual in early stained glass but it rarely survives. The analysis of fired paints, cold retouching and other surface accretions was less conclusive, either because the samples were too contaminated by lead or because the results could not be matched to existing databases with absolute certainty. It confirmed that more research needs to be undertaken in this field. While Megan and I carried out most of the treatment, we were much helped by Katie Harrison for the last weeks of the project. In total we cleaned about 60 m² of glass, we secured torn lead and replaced putty, and worked on improving support structures. John Rattenbury, was a huge support during the project. He helped us with digital media and made a massive contribution to the blog. As a volunteer guide, his help was a donation to the project and to thank him we presented him with a donor panel that Megan and I made ourselves – albeit not during working hours. 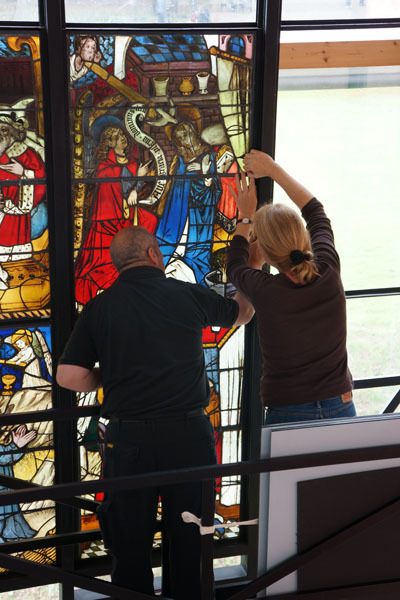 While clearly not strictly an exercise in conservation, this was a great opportunity for us to try out some of the technology that would have gone into making the Boppard stained glass and it made us really appreciate the skill and cost of these windows made by two workshops between 1443 and 1446. The last 2 years have been a real highlight in my career giving me the opportunity to focus on a conservation project in the discipline that I originally trained in and I am very grateful to the Clothworkers’ Foundation for making that possible. 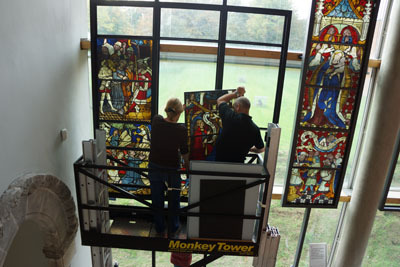 Kenny fixing the angle supports in place Marie and Kenny – The Virgin and Child and Ten commandments panels safely installed! Inserting the holding screws A job well done! The completed reinstallation including the two Bishop Saints. The small top panels have been omitted as they are c;lose to the high humidity in the ceiling. The panels look beautiful and bright after a good (and very painstaking) clean. The colours are clearer and you are aware of details missed before. Come and see them! As conservators we adhere to international guidelines provided by the Corpus Vitrearum Medii Aevi, the Institute of Conservation (Icon), E.C.C.O. professional guidelines and ICOMOS Venice Charter. 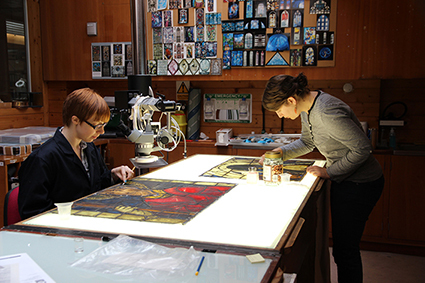 Because we are dealing with three monumental windows with a total of 34 individual panels we have to apply the same level of treatment to every one of them: some may be in a condition where restoration would be appropriate, others may not be. We have to consider time and cost. 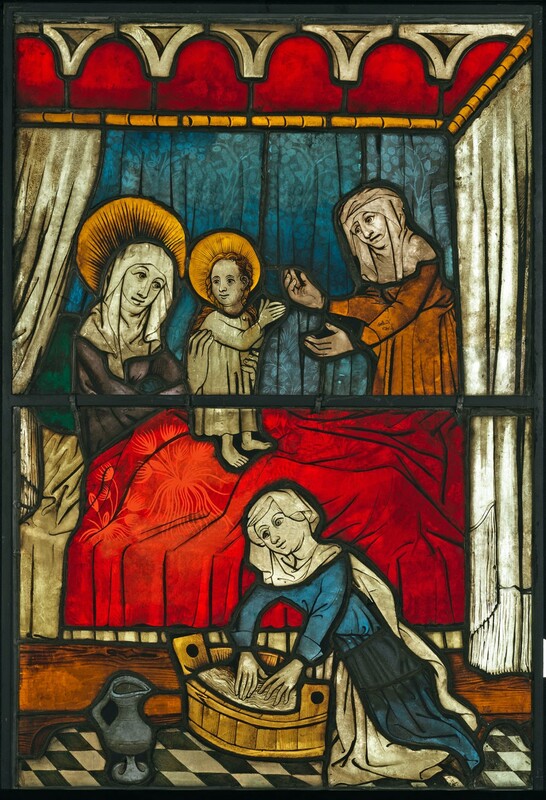 Very early on in our blog we discussed the panels depicting the Birth of the Virgin and the issues surrounding restoration and authenticity. 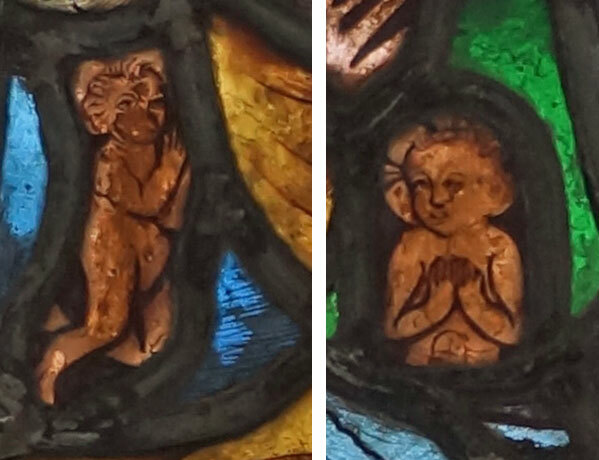 So we decided that our best option was to not interfere with the actual stained glass panel (other than cleaning it) and to try out a virtual restoration instead. This would allow us to recreate an image of how the scene might have looked without being limited by professional guidelines and time factors and most importantly we would not be interfering with the authenticity of the artwork. 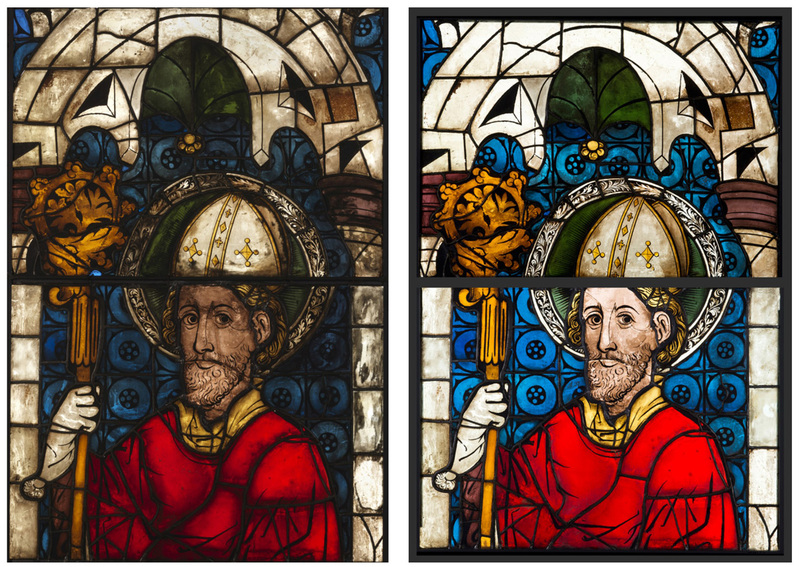 With a virtual restoration using digital technology you can explore different levels of intervention and present different restoration options depending on and directed by the condition that the original glass is in. 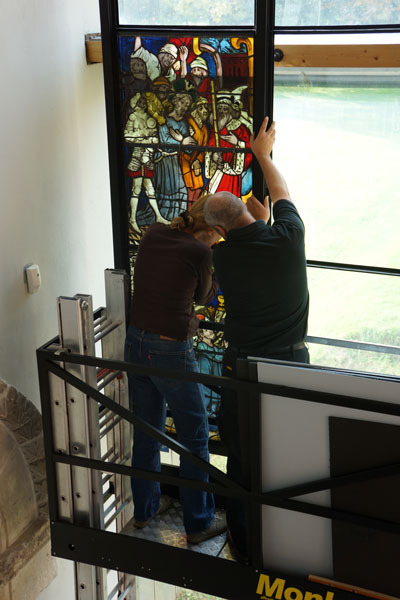 Our approach with this panel was to virtually restore the glass to a level that could – in theory – be achieved in reality. So we removed all repair leads, re-bonded broken glass, retouched lost paint, removed some of the unsightly restorations where we could identify with a degree of certainty what would have been there before, but left restorations that have replaced original glass with no trace of what was there before. The most obvious area of virtual repair was the extensive damage to the magnificent red bed cover. John took some detailed photos of the area and digitally enhanced them so that the almost invisible floral pattern came to light. 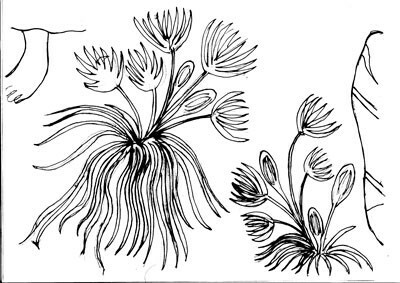 The outlines of these were traced onto transparent paper which was scanned back onto the computer and used as a guide layer to recreate the pattern. The virtual restoration allows us to recreate the detailed patterns in the fabric of the bed spread as it might have originally been seen. This is immensely exciting as it gives us a sense of how much detail the Boppard panels must have once contained! 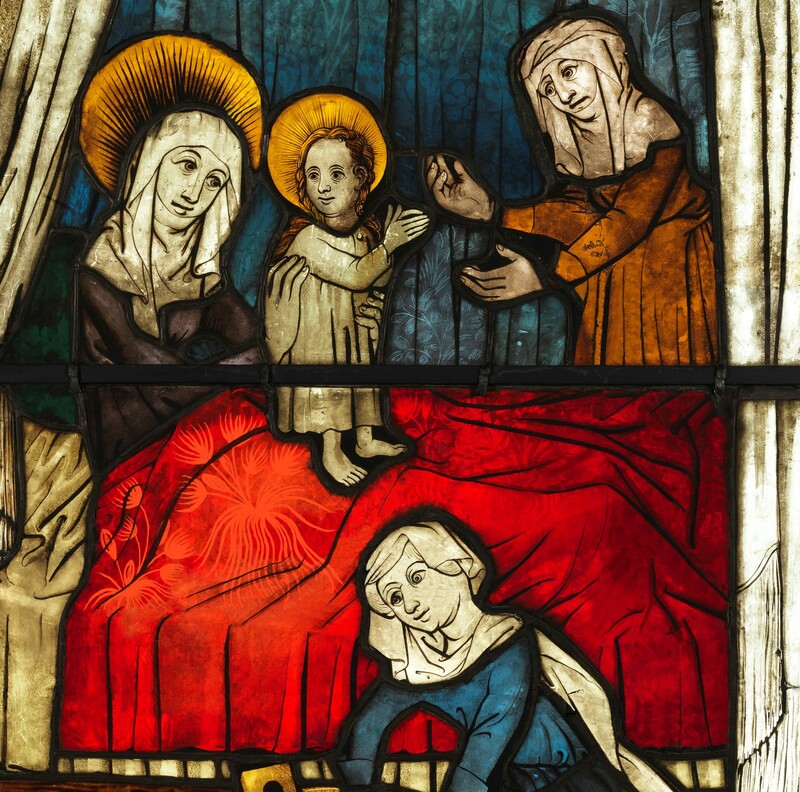 One of the most amazing outcomes of all of this work trying to recreate an image of what the original stained glass scene would have looked like is that we have to conclude that the bed spread was cut from one piece of glass! This is a very daring shape to cut, requires great skill and would have been predestined to break at the narrow point in the centre. 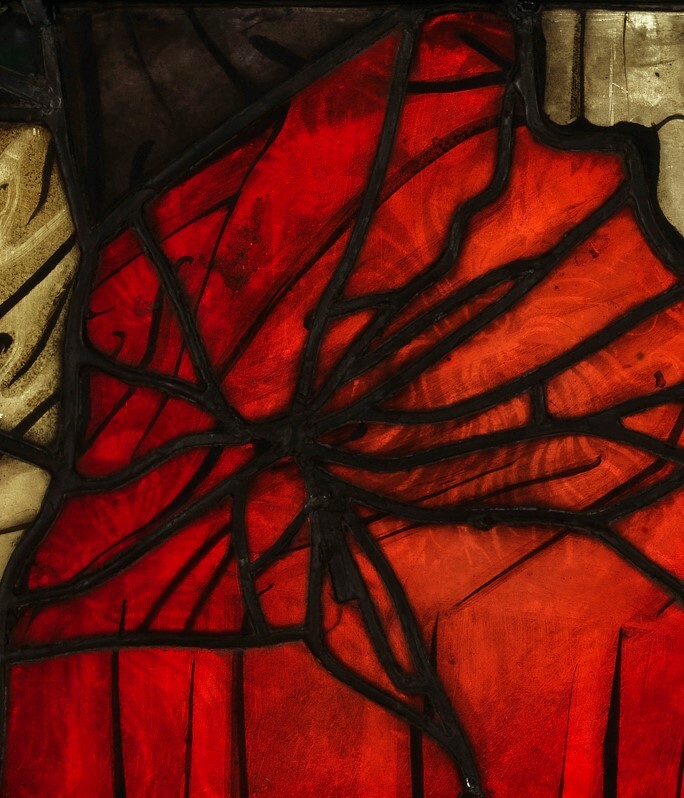 We almost cannot believe that they would have done this, using the most expensive red glass, decorated front and back, but there is no evidence of an original lead line to separate the two sections. Another key area we looked at is the head of baby Mary and the section of blue curtain just above her head. This area must have been severely damaged – both the head as well as the light blue insertion above Mary’s head are restorations from 1871. The restoration insertion in the blue patterned curtain above her head is different: so much original glass with curtain pattern remains in the surrounding area and it allows us to make a pretty accurate guess about how this would have originally appeared. We therefore decided to carry out a more sympathetic repair in our virtual restoration. John reconstructed the area by copying and pasting sections of the original curtain area and blending it into the background along with some digital painting. So much for a virtual restoration. 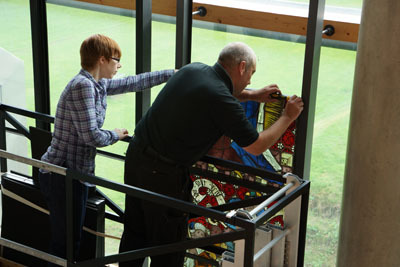 This is what the real stained glass panel looks like after careful cleaning and stabilisation. 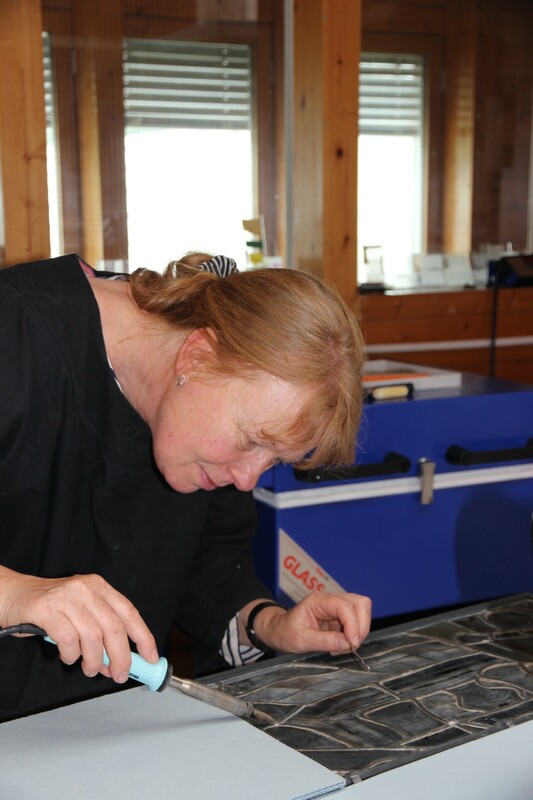 Once all the pieces of glass have been cut to shape, painted according to the design, and fired, they are finally ready to be assembled using lead. 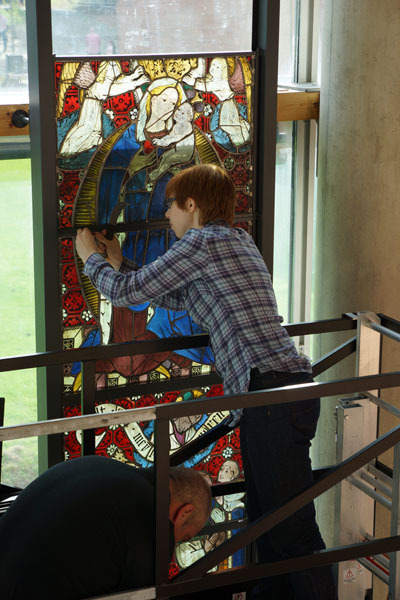 The method used to assemble a stained-glass panel nowadays has changed remarkably little from mediaeval times. 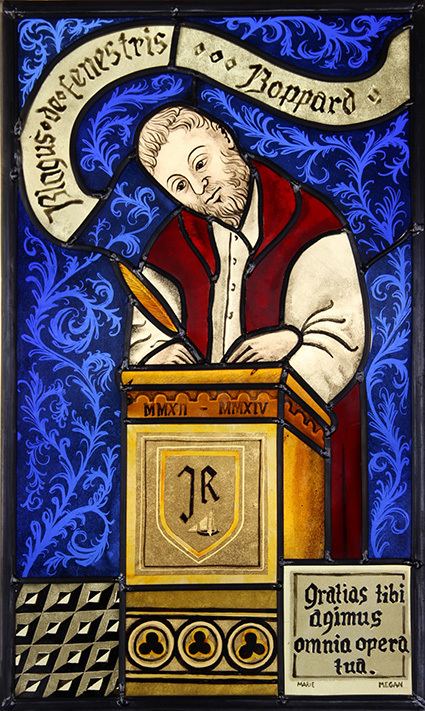 According to Theophilus, a 12th century monk, in his treatise “The Divers Arts”; a flat smooth wooden board large enough to take the window panel would have been whitewashed (using powdered chalk and water) onto which the design for the window would be drawn. The lead strips used to connect the separate pieces of glass in the panel are called “cames”. The same process of using H-shaped rods of lead has been used since Roman times, and the Latin name for the rods of lead was calamus, so this is probably where the term “cames” is derived from. In mediaeval times lead was cast in a mould made either from wood or iron. Theophilus describes the process of making an iron mould, which consisted of two parts, hinged at one end, which, when closed created a hollow ‘H’ shaped channel down the centre. Molten lead would be poured into one end then removed once cool. If you didn’t have suitable iron available you could create a mould using wood. Inevitably, this casting process resulted in large variations in the shape of the cames, which were then cut by hand to the desired size, and so are quite uneven and irregular. It was around the 16th century that the use of a lead mill for shaping the leads into a more regular profile was introduced. 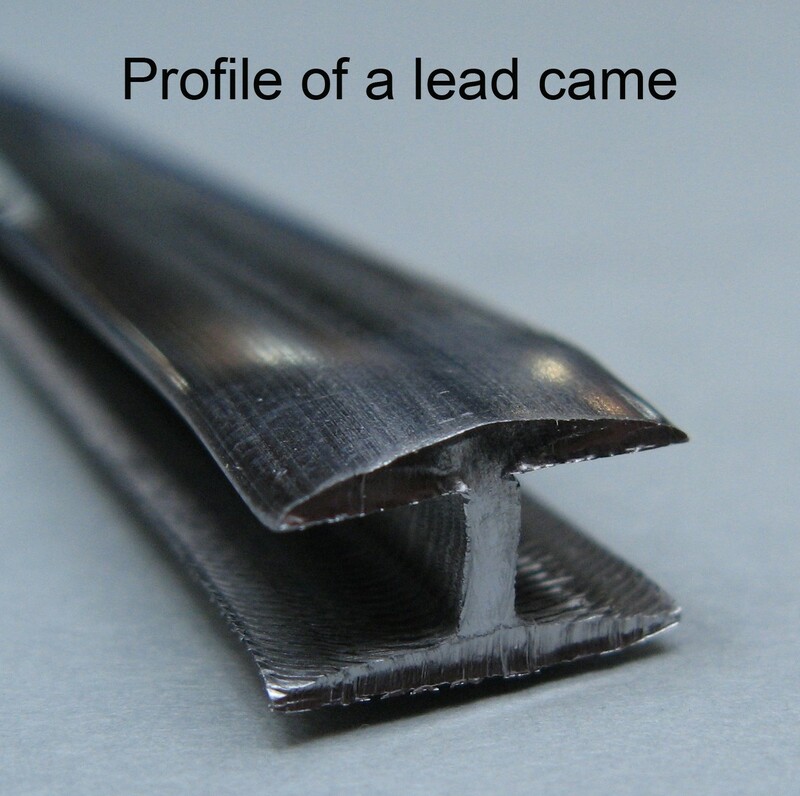 The lead used in mediaeval times, although up to 99% pure, still retained a small number of impurities such as silver, tin, copper and antimony, which considerably increased the tensile strength and hardness of the lead at ambient temperatures, making the lead network stiffer and less elastic, and also more resistant to corrosion. During the nineteenth century it became possible to produce lead without all of the other naturally occurring metals which resulted in softer and less durable cames. 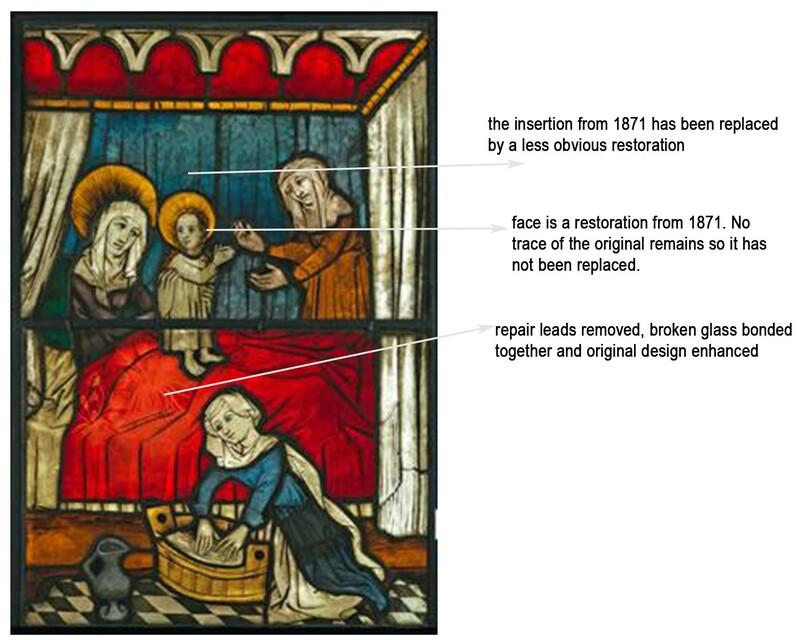 As a result of this, it quickly became necessary to replace these softer lead cames on a regular basis, which – ironically – lead to the myth that cames would have to be replaced every 100 years or so and to the routine re-leading of medieval windows. This is actually very rarely true, especially with medieval lead which is remarkably strong, and more modern lead which deliberately contains some additional trace metals that give a stained glass panel strength as well as flexibility. The nature of the lead used, the standard of craftsmanship in the construction of the window, and the weathering the window has been exposed to are all key factors which determine the amount of maintenance a window will need. It might need to be re-leaded just a few years after the original panel was made, or it might last for centuries. A panel during assembly – note the design attached to the board below the glass, and the nails holding the pieces in place. Assembly of a window usually starts at one corner of the panel and gradually works outwards and upwards. 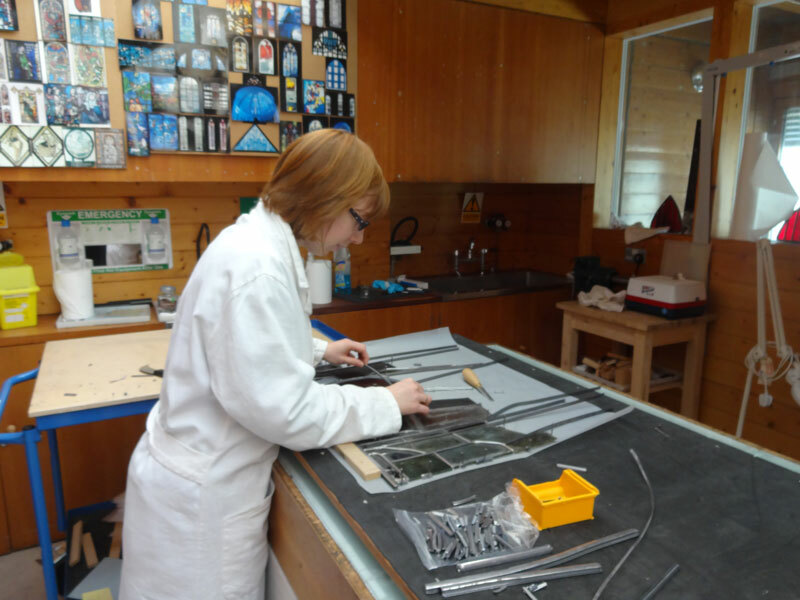 Lead strips are cut to length using a lead knife and carefully shaped around each glass section. Horse shoe nails are tapped into the assembly table and added or removed as required to hold the sections together. This process today is almost exactly as Theophilus described back in the 12th century! 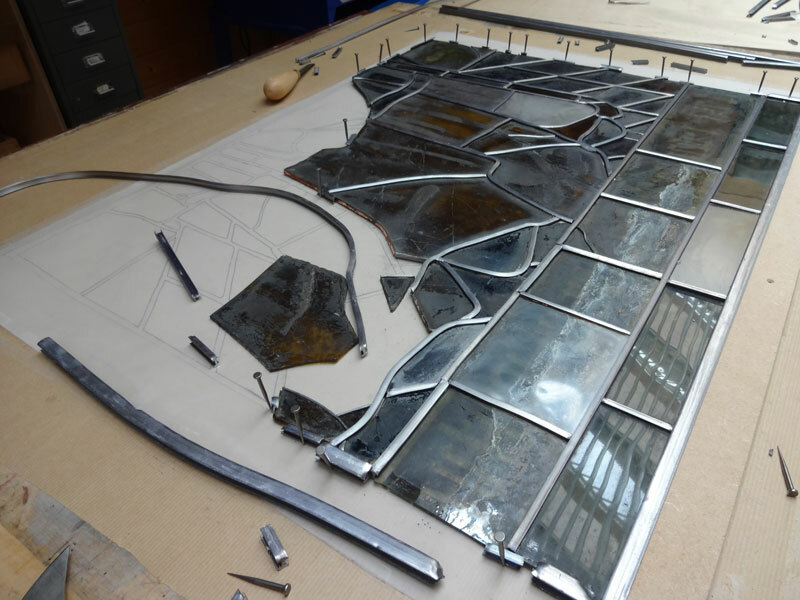 Once all of the pieces of glass have been brought together using lead, the joints where the leads meet then need to be soldered on both sides to secure all the pieces in position. Theophilus explains that the solder (a mixture of lead and tin) was cast in a similar way to the lead cames, using wooden or iron moulds. Each joint would be lightly scraped and wax would be used as a flux during the soldering The soldering iron was long and thin with one end round and shaped to a point. This would be heated with care and much experience because soldering at the right temperature greatly affected the stability of the final window. Not enough heat and the solder will not run and join the cames together securely, too hot and the underlying lead will melt and distort or even burn, potentially damaging the glass beneath. The final step nowadays, is to cement the panels. 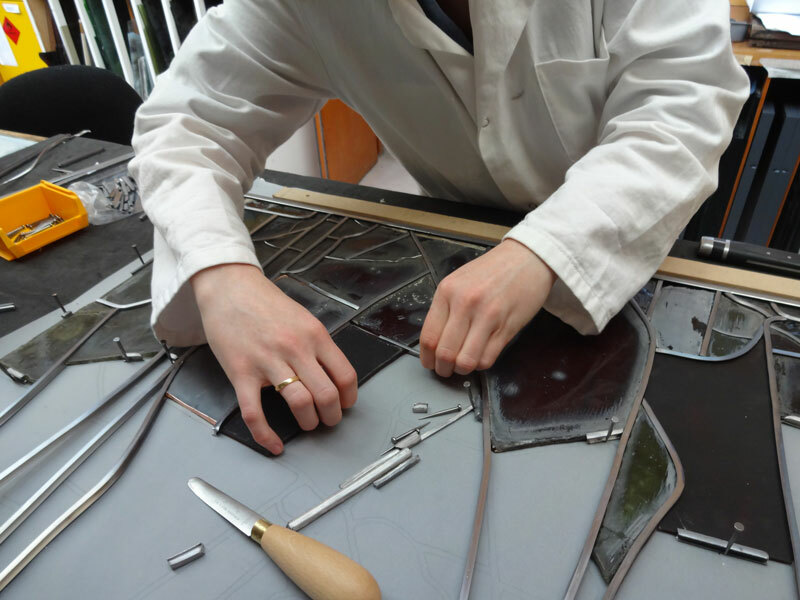 This process, in which a putty-like mix of a calcium carbonate and boiled linseed oil is worked between the leaves of the lead cames and the glass pieces, adds greatly to the stability of the panel as well as making it more wind and waterproof. There is however, no mention of this process in any of the treatises before the 15th century which suggests that no cementing took place at this time. 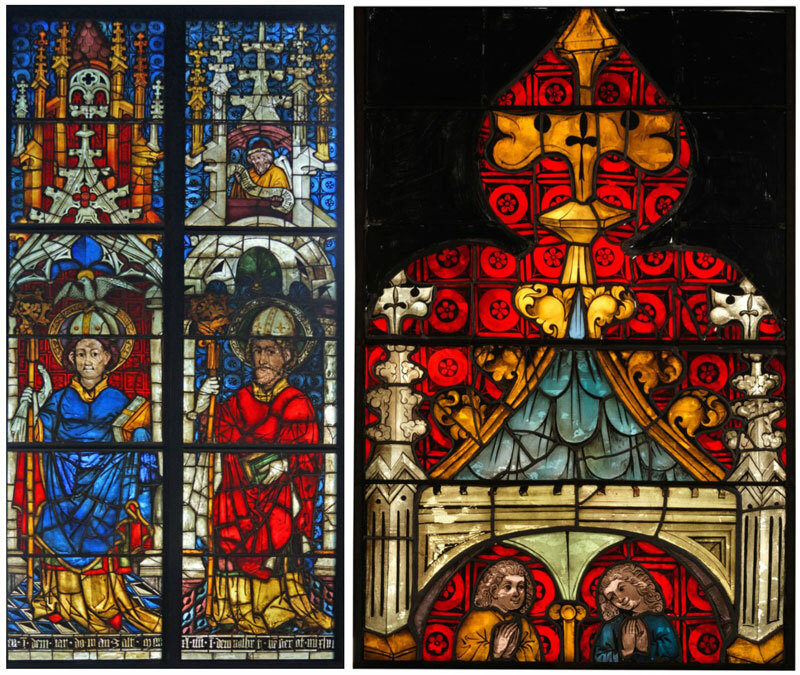 The Workshops that made the Windows for the Carmelite Church at Boppard. 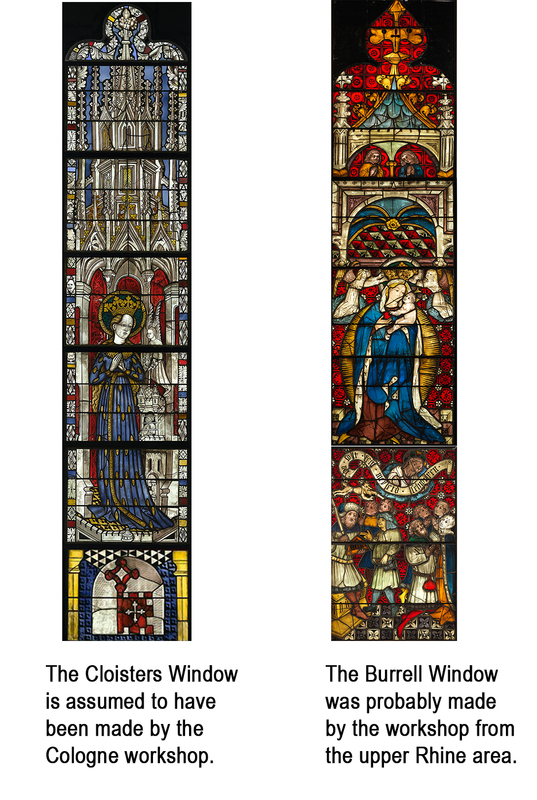 The stained glass from Boppard is fairly well researched and published but information about the makers of the windows is rather sparse and patchy. 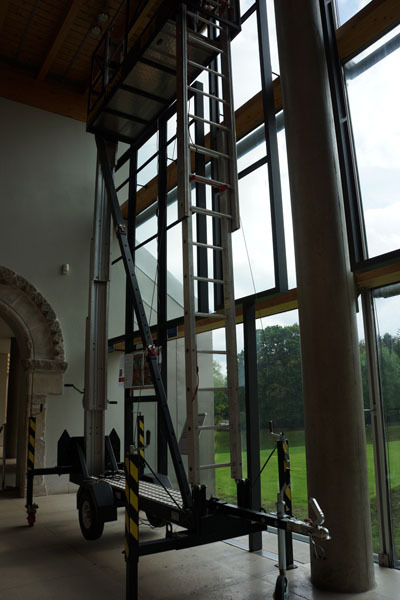 There are two distinct design styles which have led scholars to conclude that two different workshops were involved in the making of the glazing scheme. The general consensus is that one of the workshops is most likely to have been based in the upper Rhine area while the other was based in the area of Cologne. There is a high proportion of white glass especially in backgrounds and the panels are surrounded by border fillets. 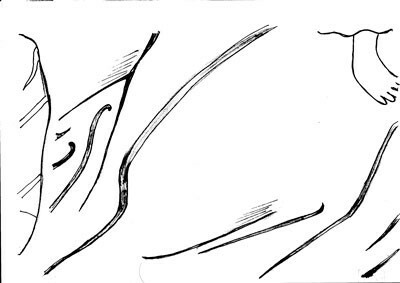 The figures are elongated with a dignified and slightly ethereal elegance. In this window the figure is positioned on a pedestal and surrounded by elaborate architectural and sculptural detail. In painting and sculpture, this style is referred to as International Gothic or “Weicher Stil” (“Soft style”) in German. The people depicted are from all walks of life, rich and poor and their status is shown by their clothes and accessories. 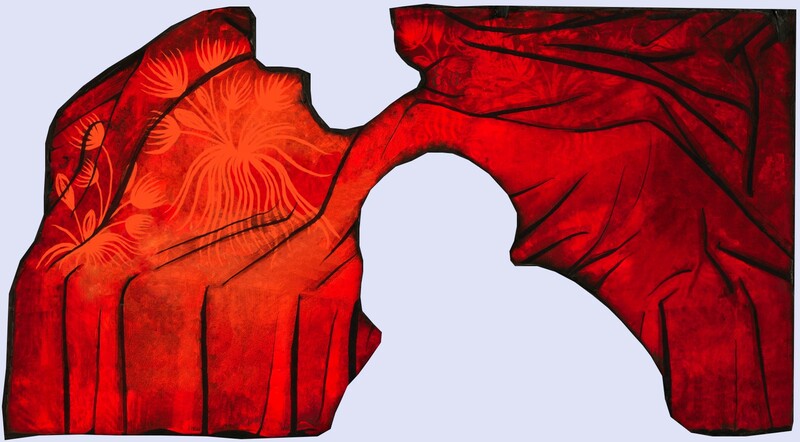 In painting this style with hard and angular folds in the garments is referred to (in German) as the “Knitter-stil” and the workshop responsible was clearly influenced by this more modern style of painting. 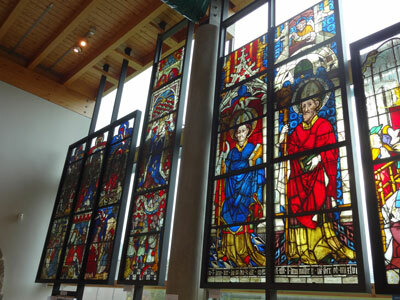 All the Burrell glass from Boppard is by this workshop – as is the window in the Detroit Institute of Art. “The Three Marys” shows a haloed woman that has an uncanny resemblance to the figure in a painting by an unknown artist referred to as the Upper Rhenish Master. 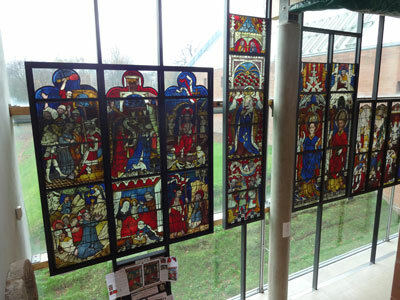 It shows how closely stained glass workshops were linked with the current art scene and is a trail worth exploring further! 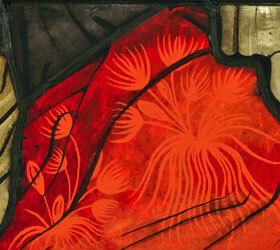 In many ways, canopies reach their full artistic expression in stained glass windows. There are no longer considerations about the practical building or manufacture of the canopy – it can just soar above the saint in splendid magnificence. They were also useful in that, since they were often painted in a light colour, they allowed extra light into the church. 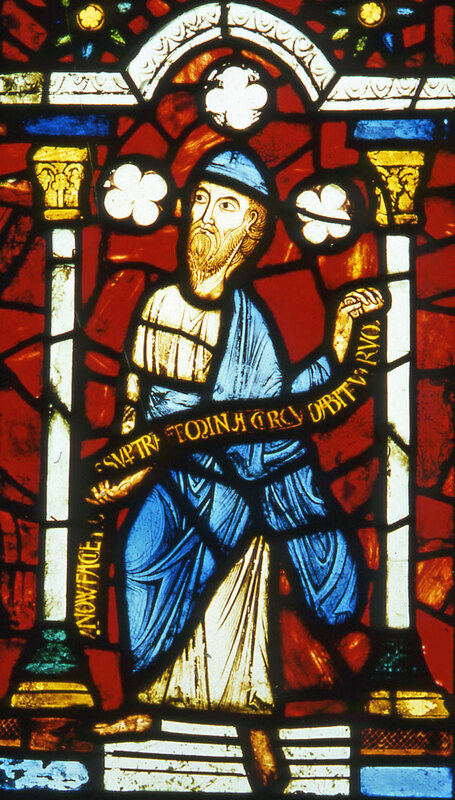 Canopies in early panels, such as that of the Prophet Jeremiah, from the Abbey of St. Denis near Paris and dating to the 1140s, are relatively simple affairs with no perspective. It is interesting to compare the architecture of the time and region with the canopies shown in stained glass. 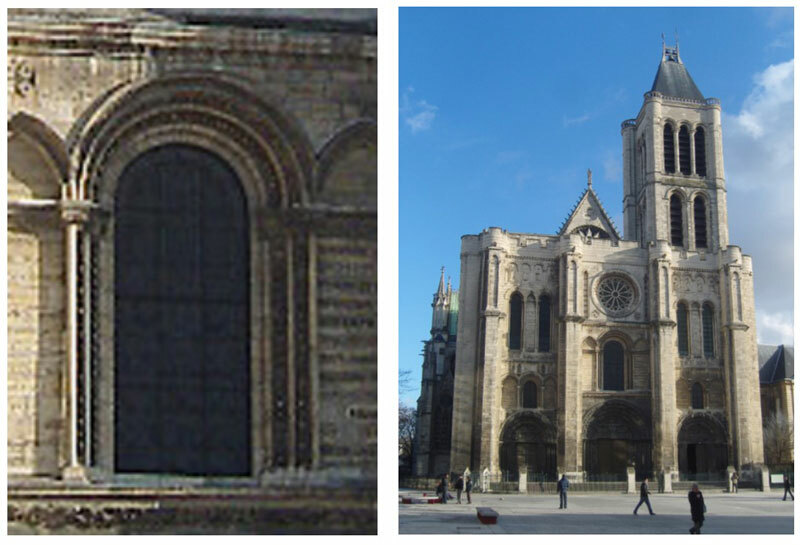 The round arches and columns of the church at St Denis are echoed in the stained glass. 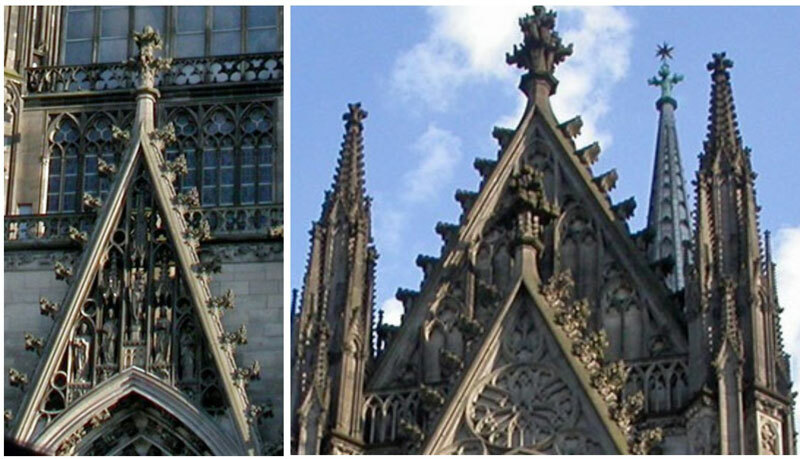 By the time the Boppard panels are being designed, the canopies were getting spectacular, as can be seen in the Boppard standing saints and Virgin & Child panels, below. 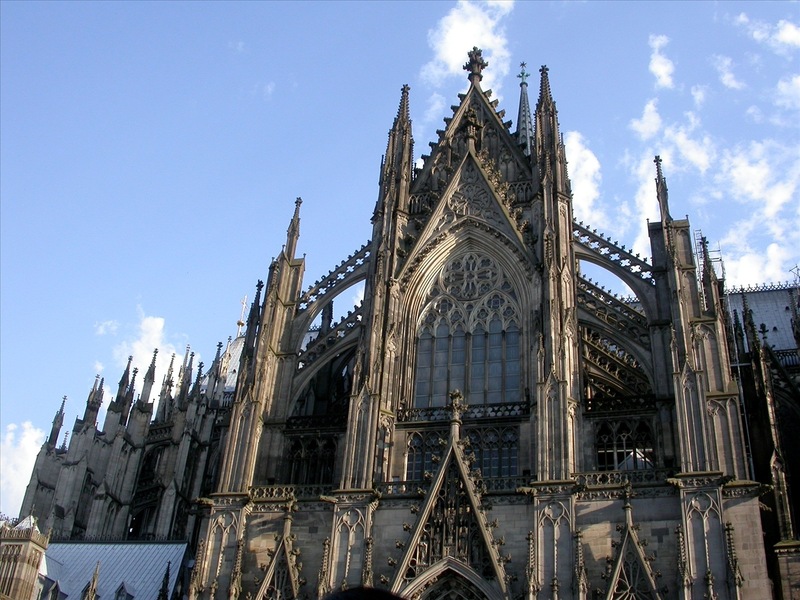 Again, compare these with Cologne Cathedral, started in 1248, and still under construction when the windows at Boppard were being painted. The two details and other features of the façade are quite closely echoed in the glass. 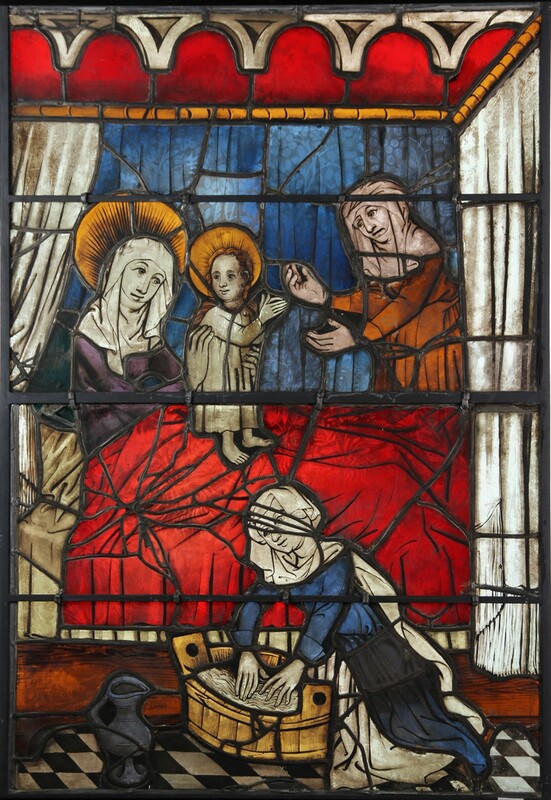 Another Burrell Collection window on display, the Life of Christ, was bought by Sir William Burrell from the Hearst collection. 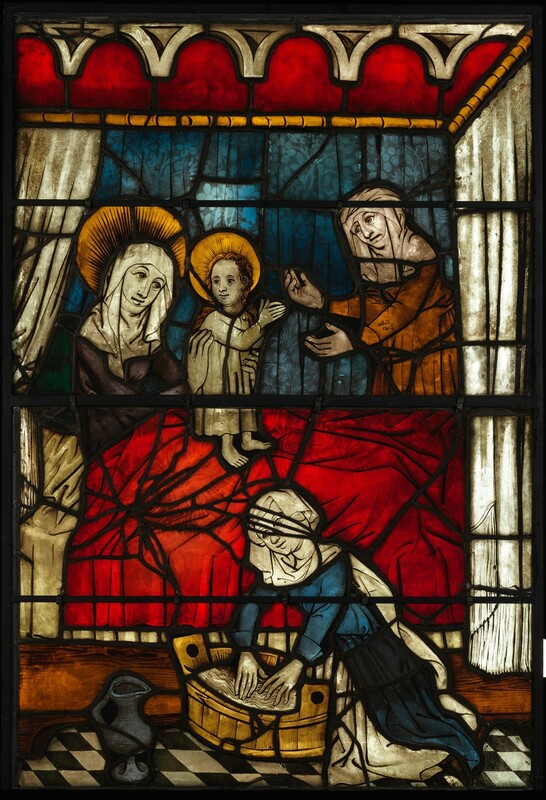 This is a two-light window with four scenes from the life of Christ; the Nativity, Christ before Pilate, the Crucifixion and the Resurrection, with the two upper scenes placed under wonderfully shaped canopies. This was made in France in the 1st half of the 15th Century, as the architectural styles which influenced the design were becoming increasingly complex. 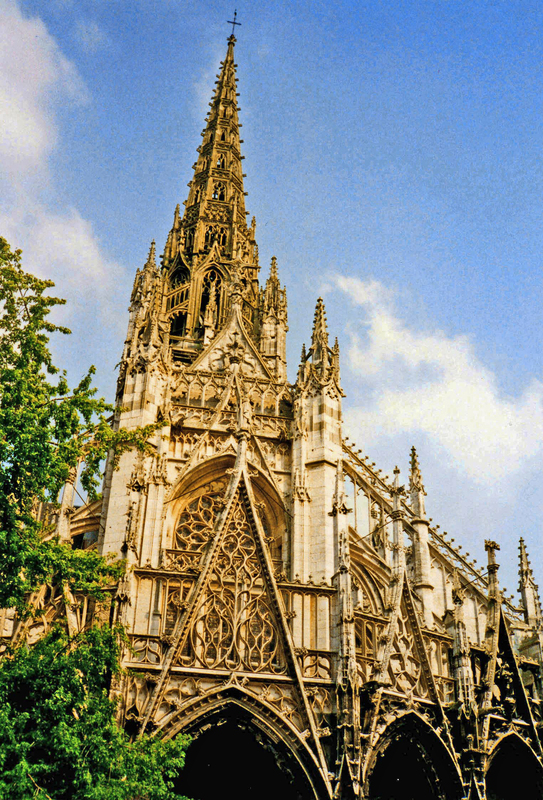 Below is a detail of the highly ornate gothic decoration on the Church of Saint-Maclou in Rouen, begun in 1437 so of a similar date to the stained glass. Finally, two smaller panels showing the Virgin and St. John the Baptist, made in the Lake Constance area of South Germany around 1310, has splendid canopies. 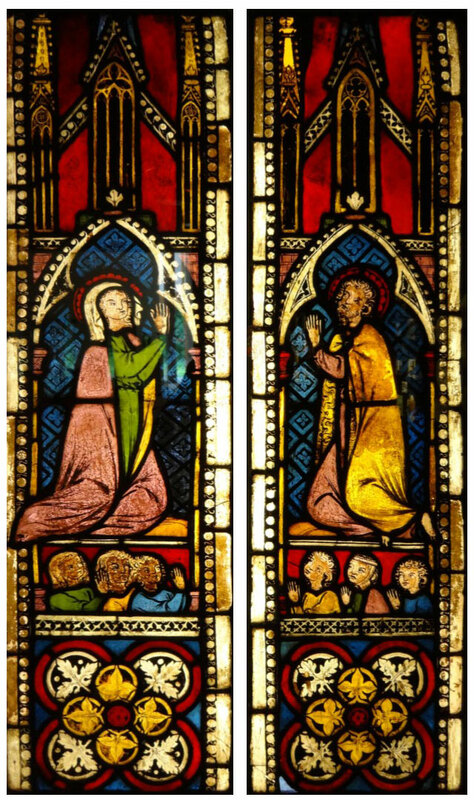 Originally part of a Last Judgment window, the two saints are interceding for the souls represented below them. Happy Festive Season to all our readers! 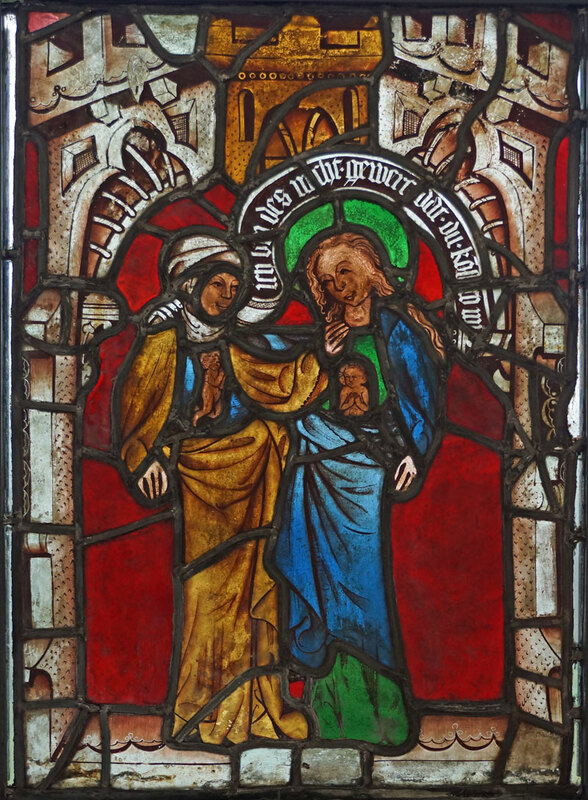 In the stained glass collection at the Burrell we have a late 14th century German panel showing “The Visitation”; the moment when Saint Elizabeth (on the left) pregnant with John the Baptist meets Saint Mary, pregnant with Jesus. Just look at the little babies acknowledging each other, as described in the New Testament in Luke 1; “when Elizabeth heard the salutation of Mary, that the babe leaped in her womb, and Elizabeth was filled with the Holy Ghost”. With the festive season upon us, our Bishop Saint, St. Severinus, has swopped his mitre for a Santa hat ready for Christmas day. 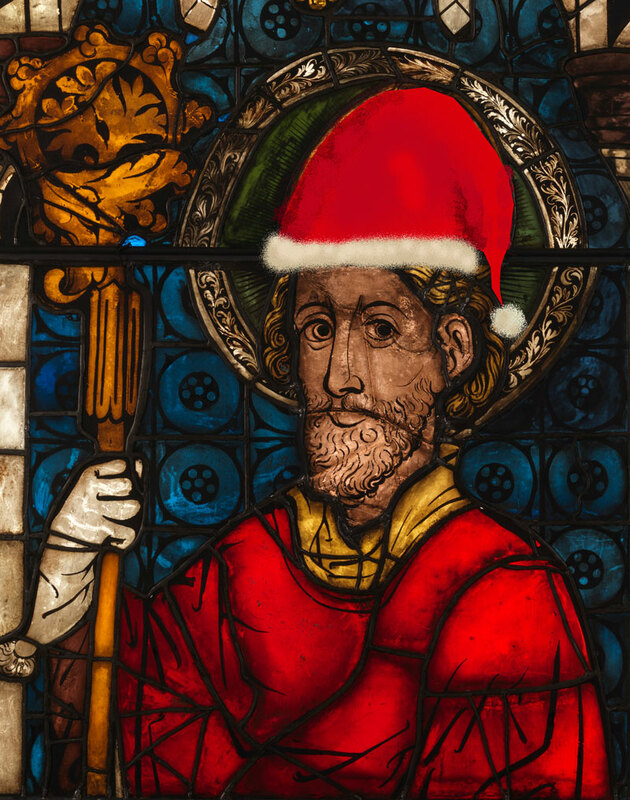 Santa Claus may well be based upon the real person, St. Nicholas, who lived in the 3rd century CE and became Bishop of Myra, in modern day Turkey. He was reputedly a very generous man giving presents and money to children and paying the dowry for poor girls. Have a great Christmas and best wishes for the New Year from the Boppard Blog team!